And, let's face it, it was about time. It was over for REM a long time ago. It was over when Bill Berry left. The first interview I ever did for Melody Maker was with Peter Buck and Mike Mills. They were playing at the Caley Paley in Edinburgh, and we met in the George Hotel. At that time, the poshest they'd ever stayed in. They couldn't afford the bar prices and made me help smuggle beer in from the tour van. Not bus. Van. I said hallo to Michael Stipe backstage after that gig. Even then, with hair, I thought he was one of the strangest people I'd ever met. Saw them at the Barrowlands. Can't remember when that was. Michael had 'DOG' written on his forehead. "It's GOD backwards." And then, memorably, met and interviewed Stipe and Mills in Athens, Georgia, while I was hitching a ride with Del Amitri on their 'sleeping on people's floors' tour of the USA. Went to Mike M's house, where Iggy Pop had been partying the night before. Mills took me to his favourite record shop and insisted on buying the REM bootleg 'We're Blinking As Fast As We Can', and the Hindu Love Gods single. We lunched on buffalo chicken wings. First time I'd ever seen frozen beer glasses. 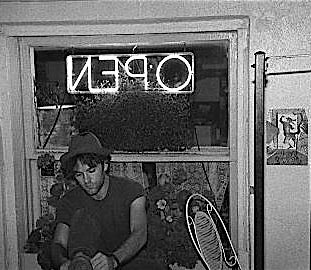 Stipe cycled right into the Rendezvous Lounge that night, and we repaired to the tea shop he owned (this was just before Life's Rich Pageant's release). 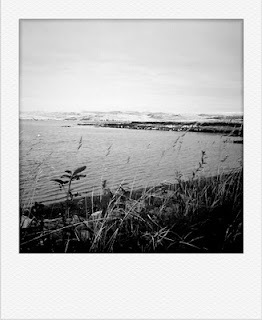 And that's where this picture was taken. By me. On the Braun Super Paxette camera my dad bought me for my 17th birthday. Stipe was still strange. But not as strange as his companions, a young man and woman, both dressed as Alice Cooper. I've always wondered, with hindsight, if the guy was River Phoenix. Clive Munro's record shop has always been the last in Britain, or at least the northernmost. It has been my favourite, too, for the quarter of a century I've known and used it. That was mainly due to Clive himself, the same age as me, with similar tastes in music. His recommendations could be trusted. His tendency to stock obscure Nick Lowe box sets, not to mention every jot and tittle of the Costello oeuvre, was wholly admirable. He is one of only two people I know who can talk knowledgeably about the work of Californian singer-songwriter Peter Case. I helped Clive with his stall at a couple of early Shetland Folk Festivals, watched vinyl vanish from his shelves (the second-hand tapes he once dealt in at two previous, tiny locations, had already disappeared) and was happy to spend cash when he moved to large Commercial Street premises, where computer games and DVDs featured heavily. A branch in Orkney opened and closed quickly. But Clive's in Lerwick would go on forever, surely? On our remote archipelago, we needed, deserved a great record shop. How would we get the good stuff otherwise? Then came Amazon. Then came iTunes. Play.com. A big new Lerwick branch of Tesco. And now Spotify. For me, deluged with free CDs due to the radio show, and with a Spotify Premium account as well, my CD purchasing fell away to almost zero. 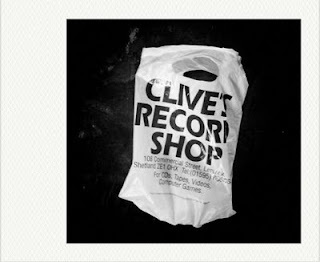 Clive announced that the shop would operate using half its floorspace, concentrating on specialised material, local folk, country and with a range of new vinyl too. But it didn't work. History is against shops like Clive's, and especially in Shetland, the internet has revolutionised shopping. Now we can have DVDs and CDs winging their way from one island (tax-free Jersey, where Play.com is based) to the Greater Zetlandics in a flash, and at prices less than Clive was paying wholesale. Or we can stream and download, listen and forget in less time than it takes to say: "How much diesel will I use getting into town and back?" So it's nearly over. The shop doors will soon shut forever. There's a closing down sale, but I've been avoiding the place, because I didn't want to look like some kind of scavenger, having spent so little there in recent months. Today, though I went in, bought a DVD, and found Clive in positive mood, looking forward to a new start doing - well, he knows not what, as yet. He has been a musical mentor and guide, a shaman for hundreds, maybe thousands of Shetland's music fans. He has stocked indie releases by local bands, put up posters, sold tickets and been a crucial force for all that's good in the world of twangy guitars and great lyrics. The last record shop in Britain will be sorely missed. But not enough, and by not enough people, for it to remain open. I felt sick. 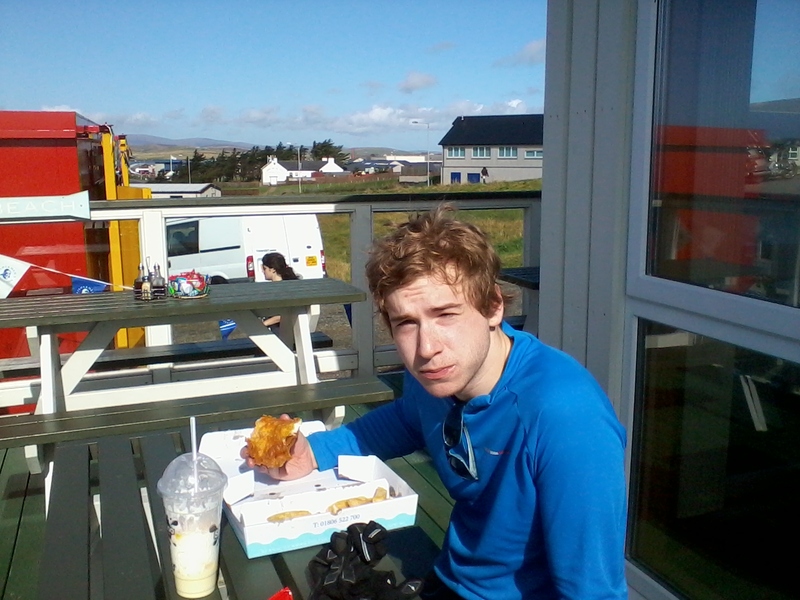 It could have been the over-abundance of granola and porridge (carb loading, on son James's advice) or simply nerves. This morning was Shetland's, and my, first cycle sportive, in aid of the Royal National Mission to Deep Sea fishermen, organised by local (and Britain's most northerly) chip shop, Frankie's. I wasn't nervous because I was competing to win the thing. At nearly 56 and a lover of bikes and their ability to get you legally to and from pubs, rather than actual cycling, that was never on the cards. It was just that having been sponsored to the tune of £200, I was very uncertain that I had the stamina or fitness to actually cover the required 40 miles. Yes, there were 10 and 20 mile options, but 40 seemed only right. James, on the other hand, fresh from a term of fixed-wheel endurance cycling and triathlon training, thought he had a good chance. He wasn't far wrong. Only a half-hour puncture repair hiatus (I had the pump; he had to wait for me, and I was last) stopped him (he claims, and I agree) finishing in the first bunch. He hauled back a good swatch of the field and finished in two and a half hours. It took me an hour more than that. There was a nasty incident with my rear derailleur (jammed chain) which took 10 minutes of oily hands and swearing to fix. 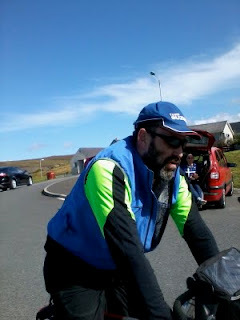 But by the time I'd finished the first 20 miles ( we were doing a double loop from Brae to Voe, then up Dales Lees to Firth, over to Sullom Voe then back to Brae via Voxter; 1000 feet of climbing )I knew I could manage 40, and fuelled by sultana cake and Ribena, I kept going through some of the best Shetland Sabbath summer weather this year. The wind was as friendly as it could be. The long, near-eternal climb up Dales Lees was unbelievably easy, but by the time Scatsta airport arrived for the second time, the windsock was pointing straight at me and it hurt. Bad windsock! 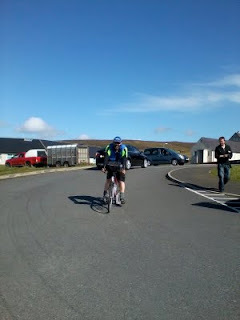 I was last in of the 40-milers (all of us male, which was surprising; there are some great woman cyclists in Shetland). But I claimed my free fish supper and milkshake with some gusto. Pain? A few back twinges but my 20-year old Brooks B17 saddle had done its job supremely well. Thanks again to all who sponsored me through Just Giving and with real cash. Finally, some of you may wonder about the choice of RNMDSF as a charity to support. Those who live or have lived in fishing communities won't. The 'Mission' does a unique and wonderful job without any kind of proselytising, and as a journalist reporting on fishing tragedies in Shetland and elsewhere I was always gobsmacked by the commitment and service to the survivors and the bereaved shown by Mission staff. The move towards ‘more speech’ on the radio show I present (BBC Radio Scotland, 14.35-16.00 weekdays, except Fridays, when it starts at 14.00) has not meant I simply talk more. It means, basically, that I talk more to other people. We’re booking what are various called ‘guests’ or ‘contributors’, mostly musicians, who come on because they have product (gigs, CDs, downloads, their own bountiful personalities, charitable endeavours, chains of boutiques, ranges of wine) to promote. Yeah, I know the Beeb's good and decent and doesn't do product placement. But the truth is, you don't get guests with nothing to sell. Unless you pay them. And we're MOST reluctant to do that, except as a last resort. So anyway,we’re widening things out to include comedians, authors, journalists and indeed anyone who might give good guesthood, on a show which is still basically about music. Speech. We like it. We review albums, preview gigs, examine people’s record collections, talk about golf, cycling, food (always a favourite on the ever-hungry TMS) plumbing, roofing and about Scotland; we sift nostalgically through our pasts. Memory works well on the wireless. Only very rarely am I face to face with any guest. I work for the most part out of a tiny self-operated studio (basically a microphone and a PC) in Lerwick, Shetland, some 200 miles from my producers in Aberdeen and the Big Huge Box that plays out all the music. The music, by the way, is mostly gleaned from what’s called ‘The Radio Scotland Daytime Playlist’ - it takes a few cues from Radio Two, but there’s a distinct Scottish dimension and me, the producers and our various contributors have a hand in what gets played too. In particular, anything I’m passionate about, and that fits into our general, uh, vibe, man, can usually be shoehorned in. No Crass so far, though. American artists, even ‘difficult’ creatures like Ryan, know how to play the promo game, and are mostly used to the long-distance remote interview, where all the cues have to be auditory. No body language to help. It’s ears and brains only. But then, that’s what the wireless is all about. Ears. And voices. Brains. People talking to each other. Telling stories. And playing records.